Is It Time To Open Your Gifts? At birthdays and Christmas, it’s normal to receive gifts from our family and friends. They come beautifully wrapped, but we don’t leave them that way. We express our gratitude to the gift giver and tear off the wrapping. If it’s an article of clothing, we try it on (unless it’s underwear, but I digress). If it’s a toy for the kids, they can’t wait to play with it (and quite possibly break it, but again, I’m off topic). If it’s an appliance, we plug it in and see how it works. Whatever it is, the order is the same – gratitude, remove wrapping, utilise. 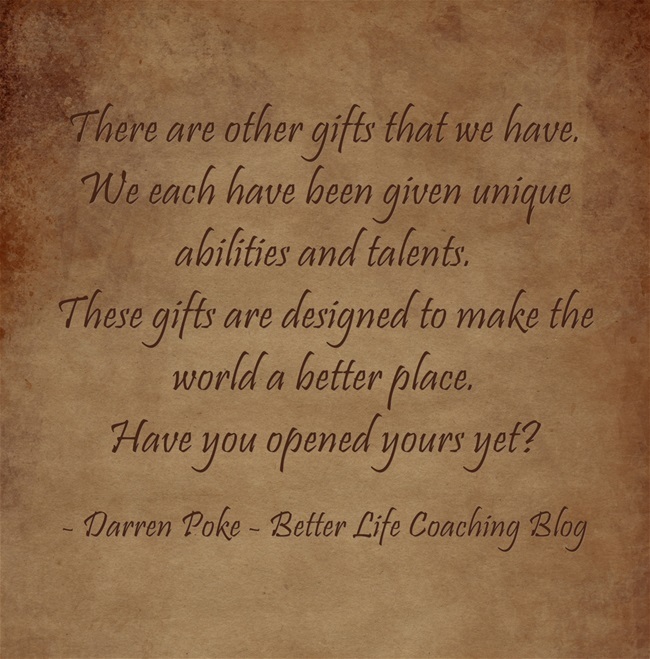 There are other gifts that we have. We each have been given unique abilities and talents. These talents are designed to make the world a better place. They are designed to glorify the giver. I’ve met a lot of people (and been there myself), who look at the gifts of others with envy, rather than being thankful for what they have. There are also a lot of people who haven’t unwrapped the gifts that they’ve been given. They have no idea just how talented they are and don’t understand the difference that they can make with them. Then there are those who squander their gifts through misuse or lack of use. It’s time to be thankful. It’s time to open your gifts. Next post – What Are Your Kids Invisibly Learning From You? A simple yet nicely written article. I agree- we must all be thankful for what we have instead of spending our time envying others and what they have.